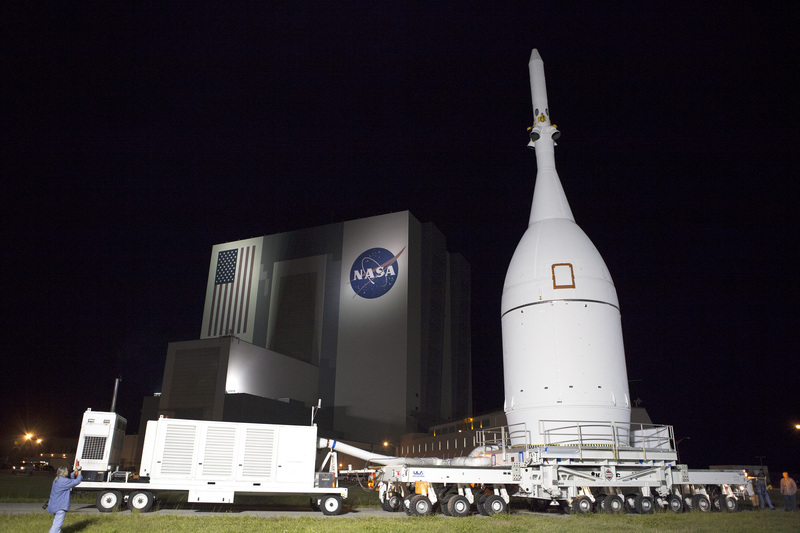 The Orion spacecraft and its transporter stand at the base of the service structure at Space Launch Complex 37. A crane inside the structure will lift Orion off its transporter to hoist it into place atop the Delta IV Heavy rocket that is already assembled at the pad. 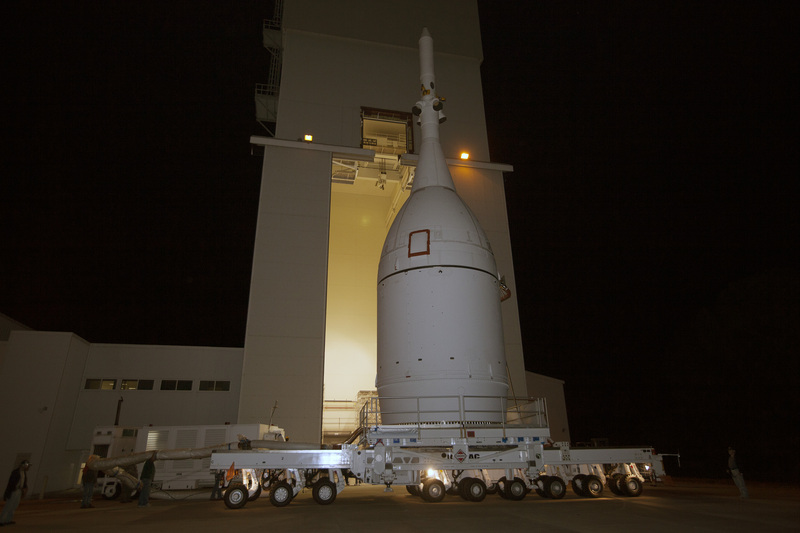 NASA’s Orion spacecraft completed its move to Cape Canaveral Air Force Station Space Launch Complex 37 at 3:07 a.m., Nov. 12. 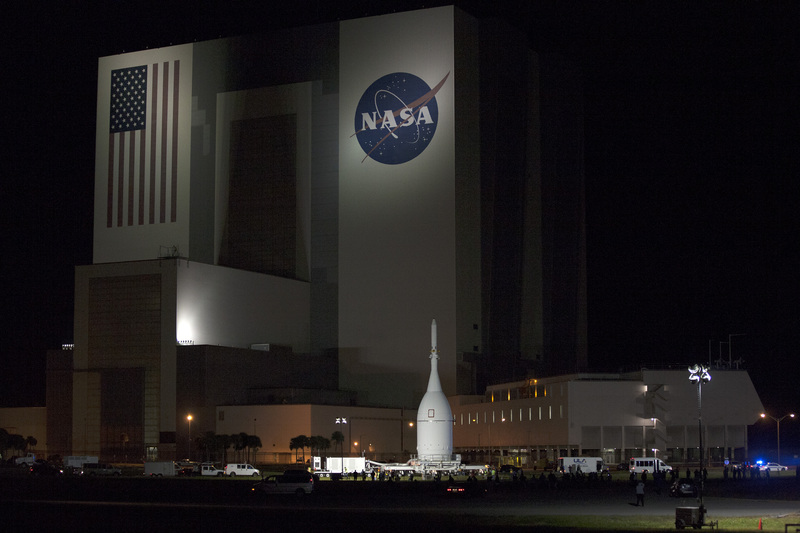 During its rollout the spacecraft stopped in front of the Vehicle Assembly Building at Kennedy Space Center, where Orion will be stacked atop the agency’s Space Launch System on future missions. It also passed by the launch pad that will launch future Orion missions to deep space. Launch Complex 39B has been refurbished and modified to host Orion and the Space Launch System for a flight test of the spacecraft and heavy-lift rocket in 2018 before carrying astronauts to deep space on later flights. Later this morning, Orion will be stacked atop a United Launch Alliance Delta IV Heavy rocket ahead of the spacecraft’s flight test on Dec. 4. 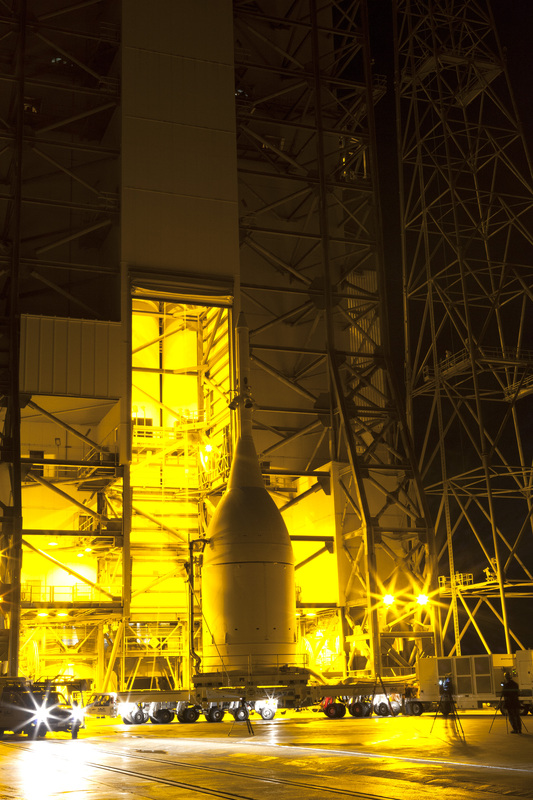 The Delta rocket will send Orion on a two orbit, 4.5 hour flight designed to test many of the spacecraft systems critical to safety before Orion begins carrying astronauts to deep space destinations in the future. Orion will fly a distance of 60,000 miles and reach a height of 3,600 miles above Earth before it re-enters the atmosphere at almost 20,000 mph and splashes down in the Pacific Ocean. The Orion spacecraft reached Space Launch Complex 37 at Cape Canaveral Air Force Station at 3:07 a.m. EST to conclude its journey from the Launch Abort System Facility at NASA’s Kennedy Space Center that began at 8:54 p.m. Later this morning the spacecraft assembly including the Launch Abort System will be hoisted and connected to the top of the Delta IV-Heavy rocket that already stands at the pad. 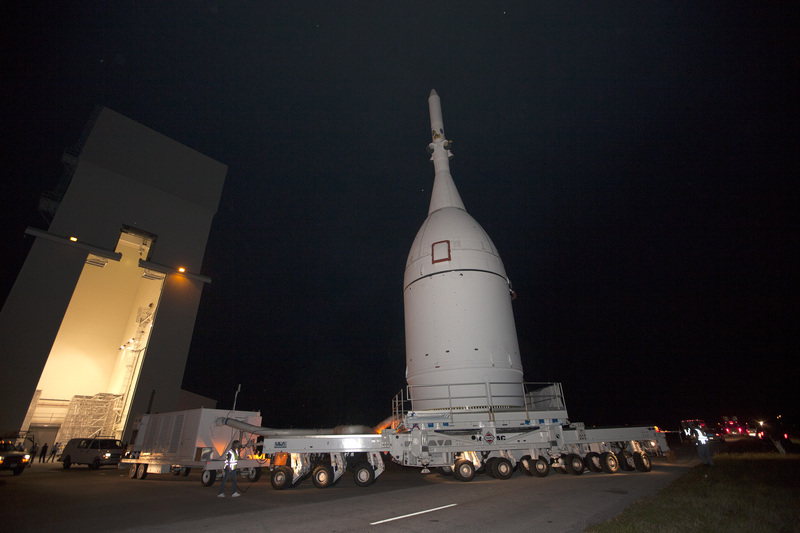 Orion will launch on its first flight test Dec. 4. 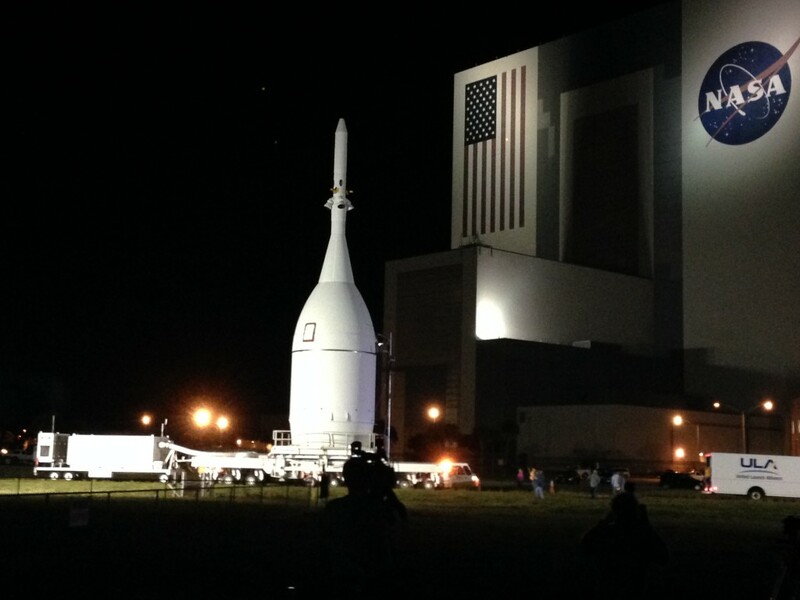 The Orion spacecraft passed by the launch pad that will launch future Orion missions to deep space. Launch Complex 39B has been refurbished and modified to host Orion and the massive Space Launch System rocket. 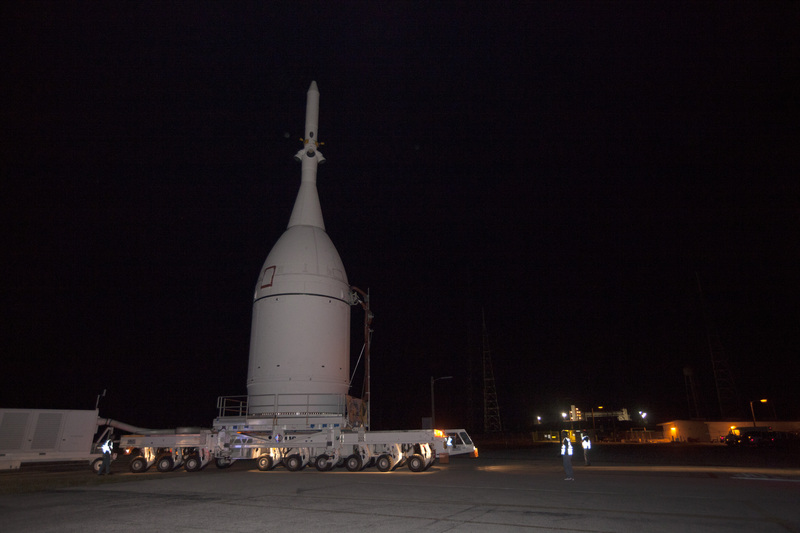 It will be used for the first time to launch Exploration Mission-1, the second flight for Orion, and the first for the Space Launch System, before the two carry astronauts into deep space on later flights. The convoy escorting Orion to the launch pad is rolling again following a short stop in front of the Vehicle Assembly Building. In the future, the Vehicle Assembly Building will be more than a short pause for Orion – it will be the place where the spacecraft gets lifted and joined to the Space Launch System, NASA’s new heavy-lift rocket being designed to launch Orion and a crew of astronauts to deep space destinations including an asteroid and eventually Mars. The Orion spacecraft paused on its transporter as it reached the Vehicle Assembly Building moments ago at NASA’s Kennedy Space Center. The spacecraft will continue its trek to Space Launch Complex 37 shortly. The Orion spacecraft is on its way to Space Launch Complex 37 this evening on the strength of a specialized transporter and with support personnel and vehicles watching its progress carefully. The move began at 8:54 p.m. ET. 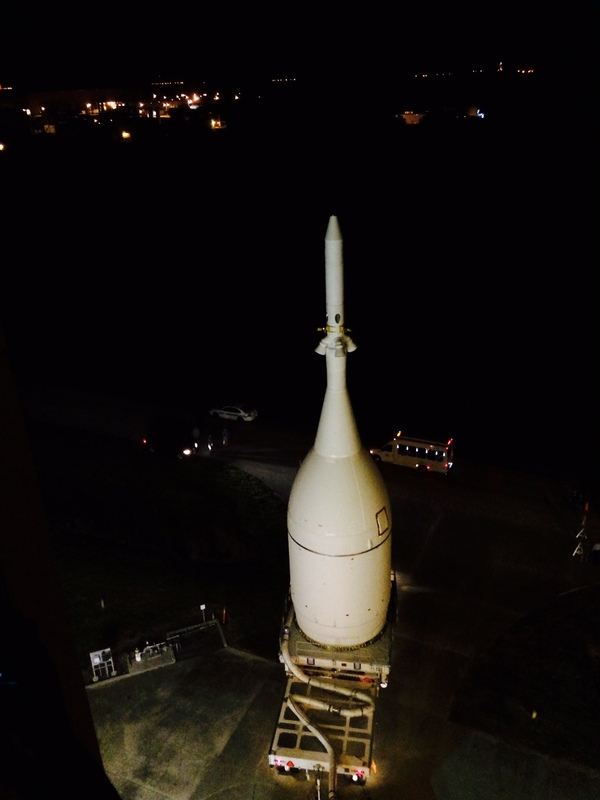 The spacecraft has been assembled for an uncrewed flight test due to launch Dec. 4. The Orion crew module is topped by a Launch Abort System and protected inside a fairing that will smooth airflow over the conical spacecraft during the climb into orbit. During an operational mission, the Launch Abort System will be able to lift astronauts out of harm’s way in the event of an emergency during the ascent into space. Resting atop a specialized Kamag transporter, the Orion spacecraft has been parked outside the Launch Abort System Facility at Kennedy Space Center this evening ahead of its move to Space Launch Complex 37 where waiting is the Delta IV Heavy rocket that will lift the Orion into space on its first flight test. First motion is expected to begin around 8:30 p.m. ET at a stately pace of 5 mph. The move will conclude at about 2 a.m.